There are a multitude of options for getting rid of fleas in your home. In this article, I will explain everything you need to know about flea traps. You will learn how you can make a homemade flea trap, and how it can be used effectively against fleas. Finally, this review will include precautions you should take when building flea traps. Flea traps are exactly what they sound like. They are devices that are capable of trapping adult fleas. Once the fleas are trapped, you can easily dispose of them. These gadgets operate on the same principle as most insect traps. They feature bait to attract the targeted insect to the trap, for example, sweet substances for flies. The majority of flea traps on the market employ heated light as the bait to entice fleas. Aside from the blood they need to survive, fleas are also partial to heat. This is why flea infestations tend to be more of a problem during summer months. The trap is set and plugged in wherever you suspect adult fleas have collected. Inserts containing a sticky or toxic substance are placed around the light source. When the fleas approach the light, they end up stuck or poisoned. Flea traps can be designed to be alluring to specific species of fleas. The cat flea (ctenocephalides felis) is a common parasite of domestic cats and dogs. One study discovered flea traps that used green-yellow toned filters over their lights were found to be the most attractive to cat fleas. These colored light traps caught significantly more cat fleas than plain, white-light varieties. Over the course of 20 hours, one trap captured 86 percent of fleas released into a carpeted room. Temperature plays an important role at different stages of a flea’s development. Flea pupae are highly reactive to heat as well as vibrations. These are signals to the flea that a potential host is nearby, and it is time to emerge from the pupa. Similarly, flea larvae require moist, warm environments to develop. However, unlike flea eggs, larvae and adults are more vulnerable to dehydration. Too much heat can kill the larvae. Now that you know how a flea trap works, you can learn to make one at home. Some guidelines for building flea traps at home recommend using candles or exposed electric light bulbs. Manufactured electric flea traps come with safety features that are hard to recreate at home. For safety purposes, I do not recommend you build traps using exposed light bulbs or candles. 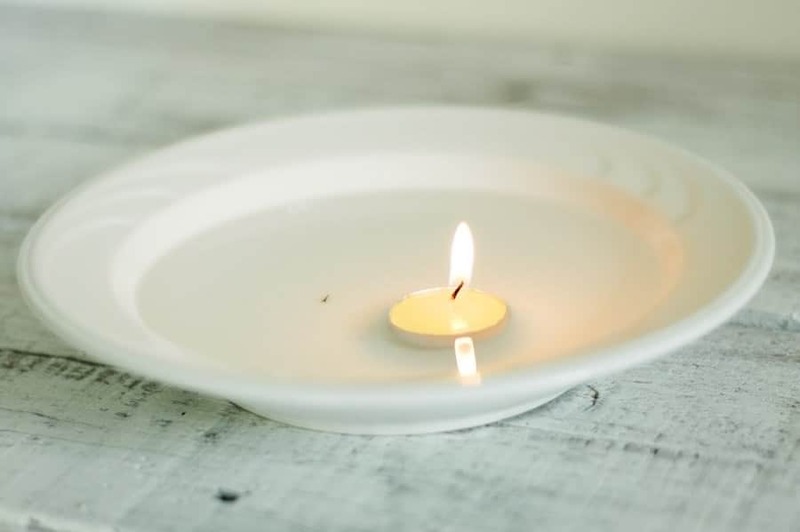 You can make a homemade flea trap that does not pose a potential fire hazard. Take note that the below trap can be dangerous to pets or young children if mishandled. It is best employed in areas not accessible to the more vulnerable members of your family. Pour water into the pie plate and add a few squirts of dish soap. Mix the dish soap into the water until it is foamy. Set the plate down in an area where you have spotted adult fleas. Place a table lamp or desk light above the plate, so that light is shining on it. Do not allow the cord of the lamp or the lamp itself to touch the water. Make sure the lamp is set far away from flammable items, such as curtains. Adult fleas attracted to the light will leap into the dish. The surfactants found in dish soaps will make the fleas sink in the water, rather than stay on the surface. Remember that green-yellow light is most attractive to the common cat flea. You can put a heat-safe colored filter over your lamp to make it more attractive to fleas. Ensuring the water is sudsy also increases the chance that the flea will suffocate. The foam can block the flea’s respiratory organs, known as spiracles. Flush the contents of the trap down the toilet periodically. This is just a precaution in case any caught fleas do not asphyxiate on the suds. Fleas are capable of reviving themselves after submersion, and can survive up to 24 hours in water. Take note that flea traps may not be effective if there are viable hosts present. The fleas are more likely to target you or your pet rather than the trap. On the same note, the fleas that are already living on your pet are unlikely to fall victim to a trap. Consult your veterinarian for a suitable flea treatment for your pet. You should try to place your homemade trap in areas where you have spotted adult fleas. Whether premade or homemade, flea traps are only effective against rogue adult fleas. There are likely fleas at earlier stages of development lurking throughout your home. A flea does not live out its entire life cycle on the host (e.g. your pet). Rather, it lives off the host only when it becomes an adult. Flea eggs slip off your pet’s fur and land in the environment. Once the eggs hatch, the larvae feed off organic debris. After the larval stage, the flea will develop into an adult inside a pupa, or cocoon. You can set multiple flea traps in areas where you suspect there might be flea pupae. Close these areas off to your family and pets. When a new adult flea emerges from the pupa, it may be attracted to the heat of the trap with no hosts around. Devices like flea traps should be only one weapon in your arsenal against fleas. You must treat your pet for fleas and use an insecticide that is capable of killing off flea larvae as well. Along with traps, specialized flea sprays can be used that are safe for application around the house and on furniture, along with various flea powders for the carpets. A homemade flea trap can be useful in catching adult fleas if you have an infestation, and you can customize them as you wish. Many people like to make flea traps using only natural flea treatment ingredients. However, manufactured flea traps may be a more effective if all you are after is something to kill fleas as quickly as possible. Regardless of what type of flea trap you choose, remember only adult fleas will be affected. Implement other strategies to remove eggs, larvae, and pupae from your home and yard.